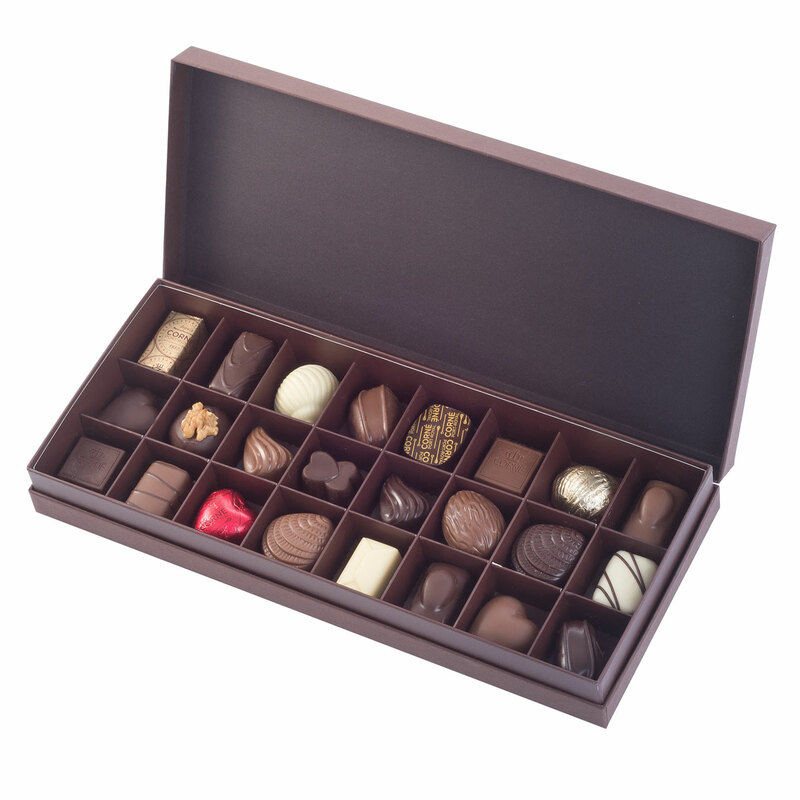 Do you want to suprise your favorite chocoholic with top quality Belgian chocolates? 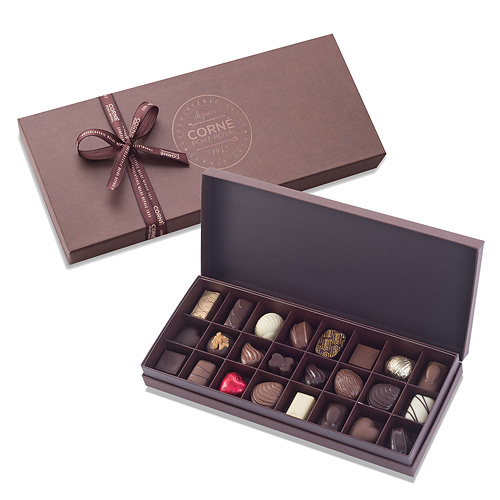 This Corné Port-Royal gift box offers a mouthwatering selection of 24 dark, milk and white chocolates that will delight all chocolate lovers. Ingredients: Sugar, cocoa mass, cocoa butter, whole milk powder, hazelnuts, almonds, glucose syrup, palm oil, butter oil (milk), cream (milk), rapeseed oil, water, stabiliser : glycerol of rapeseed, walnuts, sunflower oil, stabiliser : glycerol, condensed milk, emulsifier : soy lecithin, rice flour, skimmed milk powder, palm kernel oil, flavours, skimmed cocoa powder, coconut fat, wheat-flour, invert sugar syrup, stabiliser : sorbitol, acacia honey, candy syrup, orange peel (pieces), coffee, emulsifier : sunflower lecithines, whipped cream (Isigny) (milk), fructose glucose syrup, salt, salted butter (Isigny) (milk), honey, lactose, milk protein, salt (Guérande), raising agent : sodium carbonates, malted barley flour, emulsifier : mono and diglycerides of fatty acids, invertase, soy flour, cinnamon, emulsifier : rapeseed lecithines, preservative : sorbic acid, acid : citric acid, thickener : xanthan gum, shea butter, preservative : potassium sorbate, colours: curcumin, titanium dioxide, riboflavin, anthocyanins. Allergy Advice: May contain traces of eggs, sesame, groundnuts and other nuts.